TORONTO, April 23, 2018- Multiple people have been injured, and there are believed to have been fatalities, after a rental van mowed down pedestrians for close to three kilometers in North York Monday afternoon. 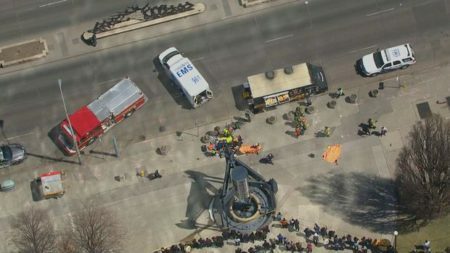 Emergency crews were called to Yonge Street and Finch Avenue East, near the North York Civic Centre, around 1:30 p.m., after a white van mounted the sidewalk and struck a number of people. Aerial footage from the scene shows multiple victims covered with blankets. The van, which appeared to be a Ryder rental van, then fled the area, making it roughly two kilometers before being stopped near Poyntz Avenue. The driver’s side door of the van – which had severe front-end damage – remained open as police taped off the area. Wisam, who asked for only his first name to be used, had just left the Whole Foods store at Yonge and Sheppard with a colleague, when they noticed the sound of cars honking and emergency vehicle sirens. 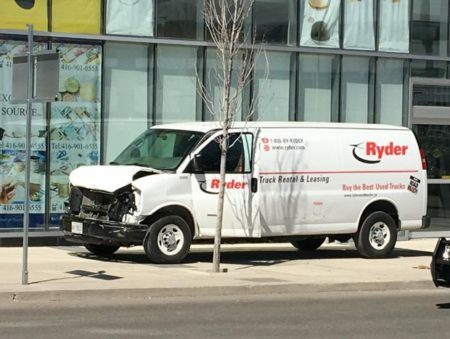 They stopped on the sidewalk and saw, from across the street, a white van with a “Ryder” logo on it driving along the sidewalk towards Yonge Street. “You could see the face of the van was already smashed. There was no grill. I think there were no lights either,” he said. Police have not released any information about the cause of the crash. The driver is reportedly in custody. Instead of stopping at Yonge, the driver of the van continued along the sidewalk, cutting the corner in front of a Tim Horton’s, and crashing through a bench and a Green P sign. “The bench on the street was completely bent backwards,” he said. The van continued along the sidewalk down Yonge, eventually turning right onto Poyntz Avenue. Wisam and his colleague followed, and by the time they arrived at the intersection of Yonge and Poyntz, they saw the van parked on the sidewalk. A man was laying on the sidewalk directly outside of the van, pinned down by police officers. Word of the incident came just as Mayor John Tory was speaking to a business luncheon in Scarborough. Dozens of police cruisers have flooded the area, and an EMS bus has been brought in along with multiple ambulances to treat victims. At least eight ambulances have reportedly transported patients to Sunnybrook Hospital. The busy area was chaotic as police attempted to tape off the surrounding streets. TTC service in the area has been suspended. Dozens of police cruisers have flooded the area, and an EMS bus has been brought in along with multiple ambulances to treat victims.